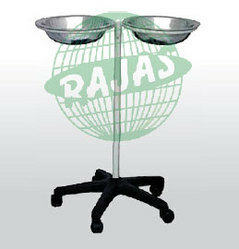 Rajas Dressing trolley made of tubular pipe construction total over all size of 30”x20”x32” the trolley with s. S. Top and frame also made of stainless steel pipe round type units moved on castors two with breaks and two without breaks provided with two s. S. Shelves, hinges of stainless steel rod on the all the three sides for the support on both the shelves upper and lower. 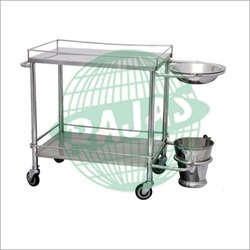 Utensils provided made of stainless steel and steel rod ring to hold the same properly welded with the trolley. Packaging Details: Knock Down Design, Fully foldable table Packed in Box each unit. I. V. Stand construction made of steel round type pipe with fully chrome plated on the heavy base unit of five castors to support the whole base, base made of gun metal and black paint exposy type rod provided totally chrome plated with height adjustable know on the side to adjust the height of the rod as per the need of the user, two hooks provided on the top of rod to arrange the fluid bottle on the same, provided with bottle holder. Base frame made of heavy duty square pipe Table top made of urethane foam covered with artificial leather Inclination of Back rest shall be adjustable Detail: Examination Table made of metal frame and metal sheet frame made of square pipe of heavy gauge and top made of sheet well powder coated paint of white color head side adjustable with the manual mechanism as per the requirements of the user provided with rubber shoe. 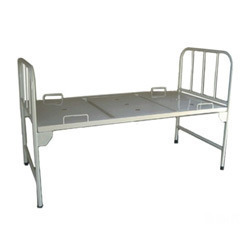 the top of the table fitted with high density foam covered with Rexene cover water proof material overall size of the table 72"x20"x32"
Rajas provide a broad array of Deluxe Hospital Fowler Beds that are highly appreciated in the national international market. 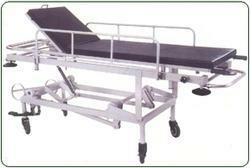 These Beds are designed with sturdy and precise steel tubes that have ‘H’ type legs on 10 cm two-castors with brakes. Our beds are crafted with perfection and have numerous features such as the movement of back rest and knee rest from foot end with two separate screws, straighten with mattress guards and duly bent perforated CRCA Sheets Section top, S.S, four saline locations are provided, side railings for safety, finished with epoxy powder coated. These beds are available at most reasonable prices. this model of bed is with over bed table which is the unique feature of our bed. Size: 198L x 90W x 60H cms. One can avail a wide range of general hospital flower beds (item code: H. F-03) that are designed in accordance with High tandards. We have designed a strong frame work using strong and high quality steel tubes that are mounted on 10 cms diameter on rotating castors for these beds. The top of the perforated CRCA sheets have four sections and are suitably bent with duly machine. Two separate screws are used for the movement of knee rest and back rest. Vertical tubes support is given to the tabular head and foot that are unequal in height. 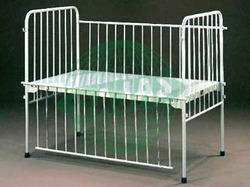 These beds are provided with safe side railings and four saline locations. Furthermore, the finishing is done with epoxy powder coated. Rajas Hospital furniture semi fowler bed's frame work are strong and precise steel tubes having 'H' type legs on rubber stumps. Having two section top of perforated CRCA sheet duly machine press bent with mattress guards, laminated panels fitted with S.S. head & foot bows. Backrest sections maneuvered by crank mechanism from foot end. Provision for four locations for I.V. Rod, safety side railings.Size:198L x 90W x 60H cms. Finish Epoxy Power Coated. 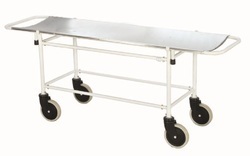 Crash Cart made of Best quality heavy gauge tubular pipe and metal sheet construction, the unit moves on the four castors in which two are with break and two are without breaks, Top and lower shelves of the unit made of stainless steel, Six number of total drawers provided on the unit three on the each sides made of plastic and the plastic tray of different colors on the frame to keep the emergency medicines the top of the unit covered from all the three sides with the help of the stainless steel rod, the handle provided on the unit to move around. The lower shelves also covered from all the three sides with the help for the stainless steel rods for the safety of the material. I.V rod and cage for oxygen cylinder provided in the trolley. Bed side locker construction made of steel pipe and steel sheet of heavy gauge, the unit covered from all the four sides and top made of stainless steel, one drawer under the top to keep small things for the user and one big drawer on the lower side of the unit fully covered and closed with the door, arrangement of lock and key to close the drawer, unit the four rubber shoes non slippery Finished with powder coated paint of thick microns in white colour. ( Knockdown Design). 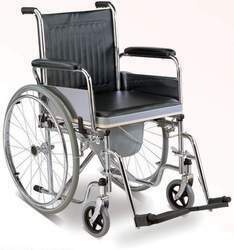 Over-all size Approx., 42"L x 28"W x 35"H, 18" Cushioned two Seat Folding & Back Fixed Detachable Armrest Front with 5" Solid Castors & Rear 26" Solid Wheels with Brakes. Arm rest cushion padded or PU made plastic handle to drive chair, foot rest made of plastic/ aluminum folding type, back seat has utility pocket, manual breaks provided. In the chair easy to fold and unfold the chair. Instruments Trolley size 30x20x20 inches made of tubular pipe complete S.S construction with S.S. top finished units moved on castors Two with breaks and two without breaks provided With two S.S. shelves, handle provided on both sides to move the trolley high edges of shelves from all the four sides to protect the material putting on shelves. 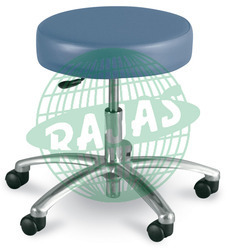 Revolving stool made of steel frame round pipe of heavy gauge, the stool with four legs and the round S.S. rod circle on the bottom to be used as foot rest to the user, top made of Good quality high density foam seat with duly covered best quality of fabric/Leather type rexine stool has the provision of height adjustment with the help of the rod rotating, finished with powder coated paint, and finished with black rubber shoe. 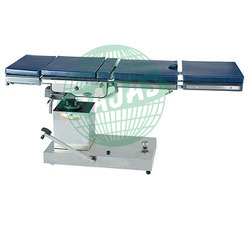 High quality operating table with built in multiple functions making it suitable for general surgery Functional design & easy to use hydraulic adjustment Wide accessory range for specialized procedures 3 section table top frame of epoxy coated steel Antistatic PU Integral mattress Height around 730 - 1040 mm. Trendelburg 25 -- +25 degree Side tilt +/- 15 deg with gas spring Back section -15 - 70deg with gas spring Leg section - 90 -0 deg with gas spring Head rest -40 --+30 deg gas spring assisted Operational area around 500X1950 Height Capable to rise up to 1.2 meter. 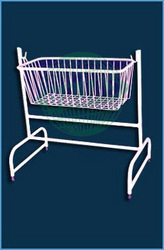 Pediatric bed unit made of steel construction round pipe, powder coated paint finish, Head and foot side extended and side rails of sufficient height provided on the both side to protect the children to avoid mishap, unit moves on the wheel provided with mattress of suitable size. Three side extension is fixed type and one side extension is collapsible type for entrance and exit of patient provision of I.V. rod and hook for urinal bag provided, sheet of the bed duly perforated type. 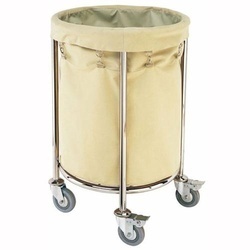 Lilen trolley frame made of round pipe construction unit moves on four wheels of heavy duty type cross pipe bottom frame and four side pipe frame and inner bucket made of thick canvas cloth the canvas bucket upper round duly covered with the cotton rope on his mouth and can be tie once pulled for closing of the mouth of canvas bucket once it filled with gargage or dirty cloths. unit ves on wheels, frame finished with powder coated paint finish, canvas bag dmouly removable. 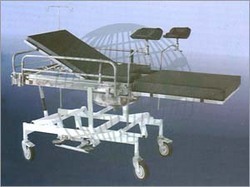 Patient Stretcher Trolley with over all size 80"x22"x32" steel tubular frame work of trolley mounted on 15 cms dia swiveling castors wheels removable stretcher top made of S.S. sheet supported on Tubular for the oxygen gas cylinders and saline rod, finished with epoxy powder coated paint, Or chrome plating optional. 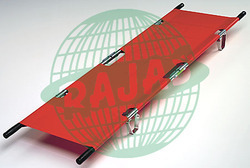 Folding stretcher made of best quality fabric sturdy with folding frame, heavy metal pipe on the both sides and cross strip provided on the both side of the stretcher to open or to close the stretcher, rubber handle to carry the unit, available in different colors standard size, light weight easily foldable. Fabric quality tatron material with stretcher size 22"x 84" with pole size of 7 fit each side four heavy metal strap u shape fit provided to hold the stretcher above from the earth. 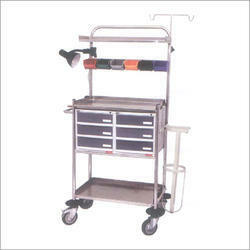 We are manufacturing a wide range of hospital trolleys like Oxygen Cylinder Trolley. These are widely used in clinics, hospitals, nursing homes etc. 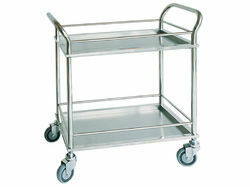 Our hospital trolleys are available in different dimensions to suit the client's requirements. Made of Round CRC pipe duly powder coated paint finish, two rubber wheel driven easy to handle and easy to pull from one to another place. Medical cabinet made of full steel frame with steel angles the cabinet with the provision of the door with glass viewing system from the front, and provided with 3 to 5 shelves inside that is adjustable in height as per the requirements of the user, finished with oil spray gun paint, provided with lock and key arrangement, cabinet fitted on the wheels in which two are with break and two are without breaks provided on the legs lower side., shelves of the cabinet made of sheet or glass as per the demand of the user. 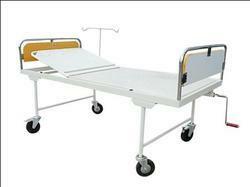 Emergency recovery trolley available in sizes: 210l x cms height 65 to 95 cms. 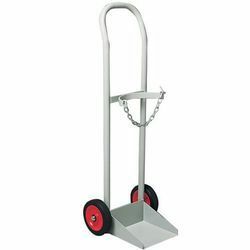 Emergency recovery trolley made of heavy duty erw steel tube, S. S. Swing away railing, S. S. telescopic saline rod, storage tray and oxygen cylinder cage. 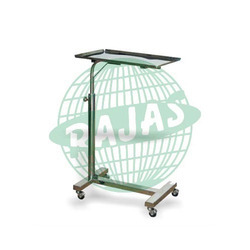 Emergency recovery trolley are removable x-raytranslucent top and provided with a tray for holding x-ray cassettes underneath the entire length of the stretcher. Height adjustment by hydraulic system, trendelentburg and reverse trendelent burg by pressure cylinder. Fitted with 15 cm dia castors-two with brakes and rubber buffers on all sides. 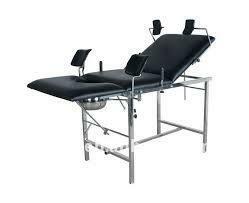 Medical examination couch's overll size: 187 x 51w x 81 cms. 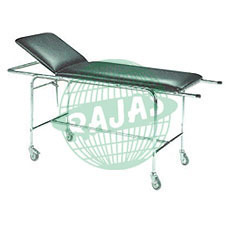 Medical examination couch's backrest: 45l x 51w cms. Medical examination couch's main frame: 138l x 51w cms. Medical examination couch are made from c. R. C. A. Sheet and machine pressed. Easy and instantaneous tilt of backrest section with the help of gas spring system. Foam padded, upholstered top for patient comfort. Cabinet in lower section for storage of medicines, bandages etc. Using sliding doors for maximum utility within limited space. Three drawers in upper section and swinging tray for b. P. Apparatus. Epoxy powder coated finish. Our rearward over bed table has been widely appreciated by our clients worldwide. Available in overall approximate size of 1120 mm x 450 mm, W x 965 mm, it consists of mild steel tubular frame work mounted on four twin wheels. salient features are as follow: The diameter of the non rusting castor wheel is 50mm Durable The top board is pre-laminated and are available in the size of 760 mm x 450mm Available in different KDC Completely pretreated and powder coated. Hospital over bed table is used for patients for taking breakfast and lunch. The laminated board top in two section measures 820x360 mm. The tubular frame work and adjustable height by means of a gas spring is easy to use and provides comfort to the patients and staff for close observation. construction of the table made of M.S. square pipe finished with duly powder coated paint finish unit moves on wheels two with break and two without break. 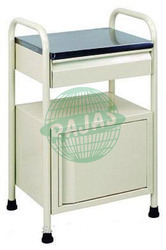 Gynecological Examination Table made of metal frame and metal sheet frame made of square pipe of heavy gauge and top made of sheet well crome plated side adjustable with the manual mechanism as per the requirements of the user provided with rubber shoe. the top of the table fitted with high density foam covered with Rexene cover water proof material overall size of the table 72"x20"x32" the supporting rods with leg holding straps provided with the arrangement of height adjustment as per the requirements, height adjustment of the rods can be placed with the help of the knob. Foot step provided with the unit for the comfort of the user. Measuring 460 L x 250 W x 230 W mm (single step) single step foot step frame made of M.S pipe round and duly powder coated paint finish, top fixed with anti static material and duly covered with angle on all four side to protect it, the foot step provided with Black rubber shoes anti static type. double foot step also available in the same model. Gyne Table construction made of stainless steel square or round type tube in two portion of the table one portion duly fitted with wooden top covered with high density of foam and finished with semi leather type material water proof nature, one basin of stainless steel duly fitted with the foot side of this portion of the table that can be easily removable for cleaning , the basin fitted in the stainless steel ring which is also removable two lithotomy legs fitted with foot side of the table and upper portion of the lithotomy legs duly covered with the foam padded and semi leather water proof material for finishing, the lithotomy legs has facility for height adjustment with help of knob, second part of the table which is also constructed with stainless steel and top made of wooden frame with high density of foam and duly covered with semi leather type water proof material, the part two is movable type and moves on wheels two with lock and two without lock. We also offer Bed Side Screen with three folds to our clients. This Bed Screen is fabricated from high grade fabrics to offer high consistency. 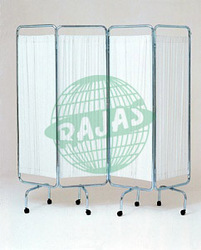 These Bed Side Screens are widely appreciated for its high durability and long service life. 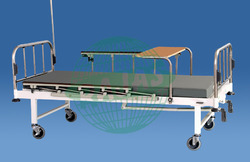 0ur hospital furniture bed's main frame are rectangular pipe, perforated CRCA sheet top tabular head and foot bown of unequal height with vertical tube supports, on rubber stumps. Provision for four saline locations and safety side railings. Size:198L x 90W x 60H cms. Finish: Epoxy Power Coated. Stretcher trolley frame made of stainless steel round pipe head side adjustable with help of the lever provided on the head side, foot side fix provided with two handle to pus the stretcher trolley top of the stretcher trolly foam padded duly covered with semi leather type material which is easy to clean and sepage proof, the unit moves on the wheels two are with break and two are without breaks. rubber shoe provided for stablity on floor I.V. rod provision on the both side of the trolley. 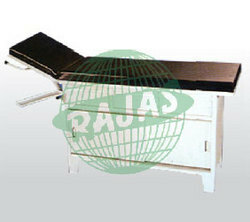 Gynecological Examination Table made of metal frame and metal sheet frame made of square pipe of heavy gauge and top made of sheet well crome plated side adjustable with the manual mechanism as per the requirements of the user provided with rubber shoe. the top of the table fitted with high density foam covered with Rexene cover water proof material overall size of the table 72"x20"x32" the supporting rods with leg holding straps provided with the arrangement of height adjustment as per the requirements, height adjustment of the rods can be placed with the help of the knob. Foot step provided with the unit for the comfort of theuser. 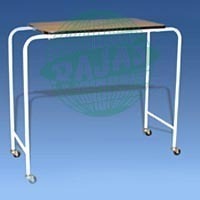 Gynecological Examination Table made of metal frame and metal sheet frame made of square pipe of heavy gauge and top made of sheet well crome plated side adjustable with the manual mechanism as per the requirements of the user provided with rubber shoe. the top of the table fitted with high density foam covered with Rexene cover water proof material overall size of the table 72"x20"x32" the supporting rods with leg holding straps provided with the arrangement of height adjustment as per the requirements, height adjustment of the rods can be placed withthe help of the knob. Foot step provided with the unit for the comfort of the user.